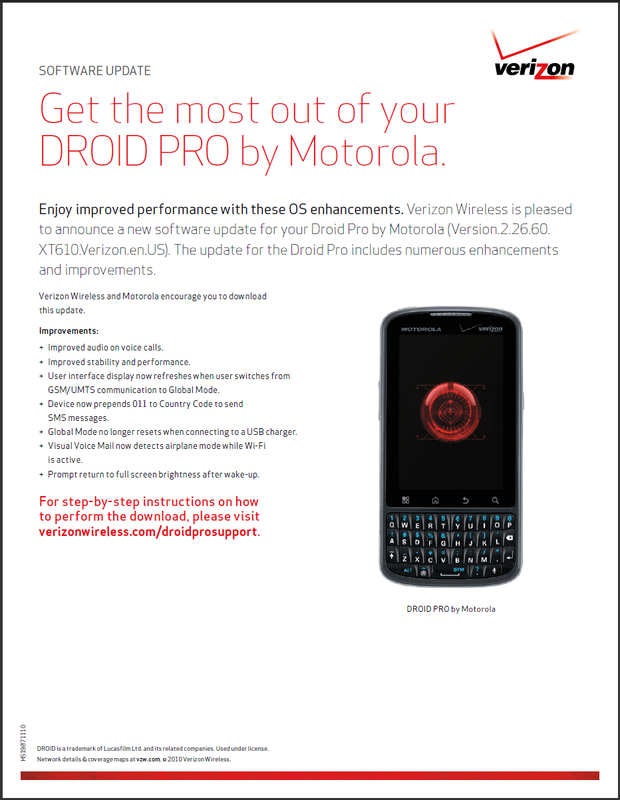 The Droid Pro (our review) is the latest family member to receive an update. With so many devices out now, seems like one pops up each week, and of course, we’re not complaining. This one appears to be pretty minor, weighs in at about 15.9MB and looks to improve a bunch of stuff. If you’d like to tell your phone to pull the update immediately, head to Settings>About Phone>System Updates on your device and it should be waiting for you. + Improved audio on voice calls. + Improved stability and performance. + User interface display now refreshes when user switches from GSM/UMTS communication to Global Mode. + Global Mode no longer resets when connecting to a USB charger. + Visual Voice Mail now detects airplane mode while Wi-Fi is active. More info can be found at Verizon’s site.